For other similarly named levels, see Green Hill Zone (disambiguation). Green Hill Zone is the first zone in Sonic the Hedgehog. It is a picturesque paradise with green forests, beautiful blue lakes, and brown checkered soil. The checkers are meant to symbolize the checkered flag, which is an icon of racing culture. Green Hill has many flowers in the foreground, as well as waterfalls and clouds in the backdrop. Hazards include crumbling platforms and spikes. As with all the other levels in this game, Green Hill is located on South Island. After completing the game, Sonic makes a brief return to Green Hill for the ending sequence. 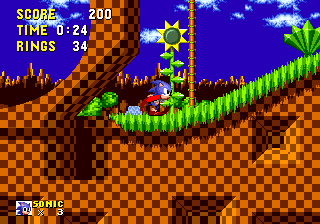 As the first zone of Sonic's first game, Green Hill Zone has become somewhat iconic, being reused in numerous other Sonic games and inspiring many others. Chopper - Jumps up from under bridges. Moto Bug - Drives along long areas of ground. Crabmeat - Moves slowly, shoots fireballs. Buzz Bomber - Found throughout the zone, shoots fireballs. Newtron - Materialises in sheltered areas, falls and speeds along the ground. Newtron - Materialises in sheltered areas, shoots fireballs. Spikes - Mostly found at the bottom of the level. Act 1 of the Green Hill Zone is fairly straightforward. Sonic is confronted with relatively few badniks and a very linear level. Simply continue on to the right, admiring the scenery. After crossing the bridge, there is a fork in the path: Sonic may fall down into the lower path, which contains the very first spikes in the game, or take the top path, which contains a few collapsing platforms and the game's first lamppost. From the starpost, Sonic may continue forward to the game's first loop, or jump up some platforms to access a series of collapsing platforms in the air that lead to a shield atop the loop. After the loop, the path splits 3 ways: The top path contains several rings and leads to the next area via a series of collapsing platforms. The bottom path leads to an S-shaped tunnel (with a lamppost in the middle) in which Sonic can gain much speed and be propelled into the air in the next area, where many rings reside (and where the top path ends). The middle path has a shorter S-tunnel and leads to a single floating platform near the large collection of rings. After the rings, another simple fork with relatively uneventful obstacles both lead Sonic to the act's big ring. Act 2 of the Green Hill Zone is also a bit straightforward, but less than act one. After you cross the first bridge, you'll find a rock that is perfect for doing the walk-jump and a sset of spikes on the left. You can choose to jump down (tricky) to get a shield and some rings from a monitor, or just continue on. Go until you find a large swinging platform. If you want to, collect the shield on the tree just beside a rock. You can either take the swinging platform to the other side or jump down for an obstacle-filled path to an 1-up. If you went to take the shield and the rings by jumping past those spikes, you will meet the first breakable walls in the game. Spin through them and you'll find a Power Sneakers monitor on the other side, and that lower 1-up route. Actually, you can use these Power Sneakers to just jump over to the top of the loop containing the 1-up without taking that path and a red spring at the end of it. After that loop, you'll reach the area with the spikes and moving platforms. Those moving platforms move up and down, and if you fell of them, you'll recieve a hit from the spikes and death from the bottomless pit beneath the platforms... but you can collect the invincibility on a tree before this area to be able to jump back up from the spikes and avoid death. There's a checkpoint in the middle. After this area, you're very close to the end. just continue on or get some more rings from a platform above or take the passage below. After either jumping up from the lower passage or taking the spin tunnel down, you'll reach the end of this act. Green Hill Zone is followed by Marble Zone, which uses some of Green Hill's tiles. There are some bizarre bumper-flower-things you can place in the ending with debug mode. This bumper is actually one of the bumpers from Spring Yard Zone and the special stage, using art from Green Hill to define itself. There is also one pink flower. Green Hill is a very commonly hacked level, and is usually the level of choice for beginning hackers; it uses relatively few tags, and the tiles (for the most part) fit together. This page was last edited on 8 April 2018, at 08:47.